This fan turns on only when the kick stand is up i.e. when you need it. Other methods can be chosen but I found this to be the best hassle free setup. Summary: You wire the positive to the battery with a fuse and on/off switch and the negative goes to a on/off based negative source. The kick stand cut off switch is the best choice for the F2/F3 here and is mostly universal but every bike can be different. This is how to is specific to the F2 however this applies to the F3 and really any motorcycle that has a regulator/rectifier and uses a kick stand cutoff with the negative wire being the effective wire that goes on/off. The core concept is to wire the fan directly into the battery for the positive terminal, and the kickstand shutoff negative for the negative terminal. battery charging terminals from battery tender with multi-terminal connector that has a ring set and a standard clip on set. Walmart/any parts store carries these. I chopped the clip on (same type of connector used for jumping auto) charging wire that plugs into the battery tender's connector wire and I use this to wire the positive wire for the fuse. I wire the fuse to the On/Off switch and mounted that in the convenient area closest to the reg/rec. I then wire the lead out from the On/Off switch to the fan with the negative wire hanging there unconnected. Next I connect the ring style charging cables from the battery tender to the battery like you would normally do if you were to use a battery tender. 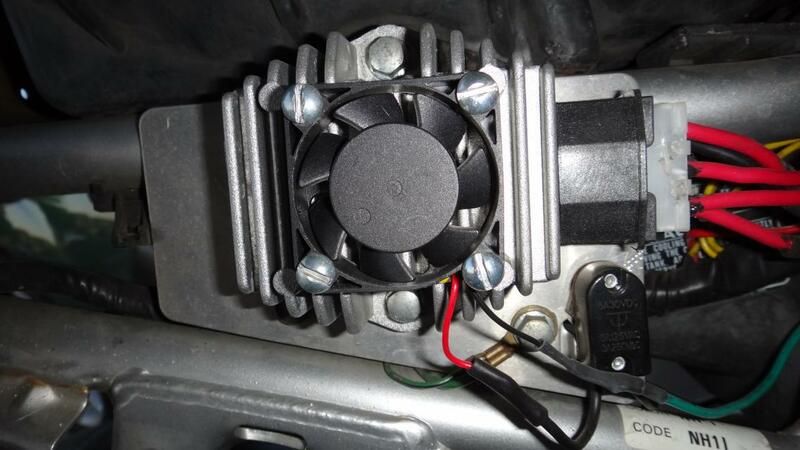 You now have a battery tender wiring setup too that you can swap in for the fan when not stored. Now you find the kick stand cut off switch. 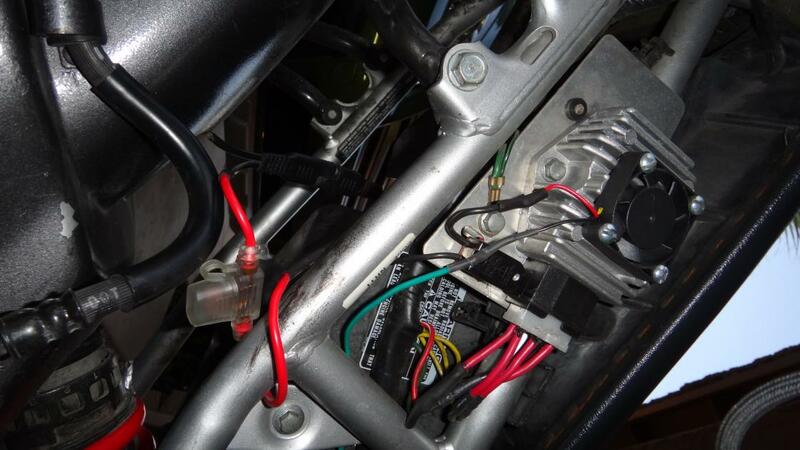 The Honda CBR F2 uses the negative wire as the on/off hence why I chose this wire to bridge into. You can use a terminal bridge, or scrap off some insulation and do a solder joint. This is up to you and what you can work with. 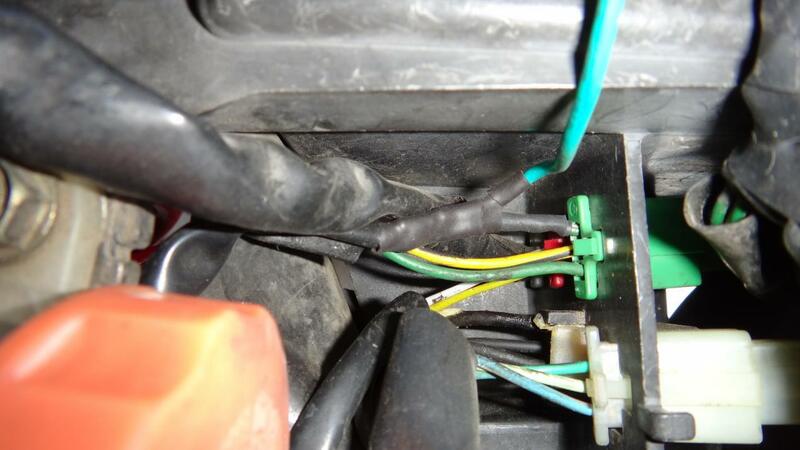 Once the negative wire is connected into the kick stand cut off switch, and the positive with fuse link is connected from the battery terminal tender o-ring style connectors, you're now done! Good mod. One of those ones that if it was designed correctly in the first place, we wouldn't need to do this. Good thinking with the sidestand switch. Alternatively, you can patch into the ignition and run it that way. That way you are pulling a fused +12V and don't have to wire to the battery. Thanks and totally agreed on proper engineering... I'm double screwed living in AZ so the fan is a must for summer and sustained high RPMs. Ignition isn't a bad idea either. I didn't want to risk pulling anything on that circuit not cut the wire but I did consider it. Another idea would be to wire in a capacitor and diode to ensure spike back into the system and a clean charge to the fan but so far that seems over board from no issues in the 4 years I've had this installed. Perfect time for me to see this, thanks for posting. I just got my R/R in from China, hopefully not a cheap POS, It looks pretty much OEM which we all know have overheat issues, I am a PC Technician by trade and definitely have more cooling fans around than I know what to do with, at least now I know what to do with at least one of them. Def and hope it helps you out! So I've had this fan for around 5 years now and I still have the same Reg/Rec after the same 5 years and no issues. It's been through track n some brutal summer rides in AZ but it's never burnt me like it used to when it would die every summer. I definitely recommend this mod!